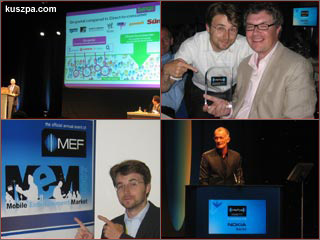 Me at MeM, lecture of Martin (bango), Russell with the MEF Award and the host Ray Cokes. It was time for me to visit for the first time the Mobile Entertainment Market (MEM) – the official annual event of the Mobile Entertainment Forum (MEF). This year the MEM was arranged in the Grimaldi Forum in Monte Carlo. I was especially interested in the topics „Mobile Communities & User Generated Content“, „Going Direct to Consumer with Off-Deck Services“, „Creatively Promoting Content so Consumers can Easily Discover it“ and „Promotional Strategies“. The MTV Best.Show.Ever Evening Award: ??? All in all it the Mobile Entertainment Market is a great event for networking, but I was a little bite disappointed that some of the announced speakers mist, like Joanna Shields (President International, bebo) or Graham Thomas (Head of Data Product Marketing, T-Mobile), and that there were not so many exhibitors in place. You can read about similar impressions on GoMo News and KAsiUNblog. Update: And Helen is running a small survey „Thoughts on MEM/Global Messaging 2007“ on her blog.